Choosing the right bed for your child can be a difficult process. Do you want a plain old simple divan or a bed frame with mattress, and, if you have more than one child, bunk beds may be an option - the choice is seemingly endless! However, why not consider a mid sleeper bed? These are great for children, whether they are really young or into their teens. Here’s why you should consider getting a mid sleeper for your child. Ask any child what they want from their bed and you can guarantee something a little more exciting than your bog standard plain old bed will be on their list. They want their bed to be somewhere they can’t wait to go, to lay down and go adventuring in their dreams. Some have tents underneath which can be a den, or a house, or a tent or a palace in their imagination and these designs help inspire creativity. A mid sleeper bed fulfils their fun ambitions whilst also fulfilling exactly what you need it for - a place for them to sleep. Isn’t that what every parent wants? Mid sleepers are great for helping you maximise the space in a bedroom. Whilst it may not be needed in their younger years, older children will need a desk to do their homework at and that along with their bed and other bedroom furniture can take up an awful lot of room. A mid sleeper cabin bed with desk could be the perfect solution to this problem, giving you that little bit of space back that you didn’t have before. Forget a bedroom where you can barely move, have that extra space back! Whilst helping to maximise space, they also provide plenty of storage for their stuff which is perfect especially if your child is in the box room. Many come with bookshelves and little cubby holes where different items such as toys, games or clothes can be stashed away. Whatever your child has a lot of, one of these beds will help with the storage problem for sure. If required, most mid sleeper cabin beds can be converted into a single bed once your child has outgrown the fun side of it. This means that you effectively get two beds for the price of one so you will still get plenty more use out of it. That’s a great financial investment, wouldn’t you agree? Some can also convert to bunk beds if another child needs to move into the room which I think is a fantastic idea. Mid sleeper beds come in many different exciting designs. Some are normal mid sleepers painted in a block colour, some have different patterns or colours on the bed frame. Some have tents underneath, some have desks and some have plenty of book storage. There are so many different designs to choose from that you and your child won’t know which one to pick! 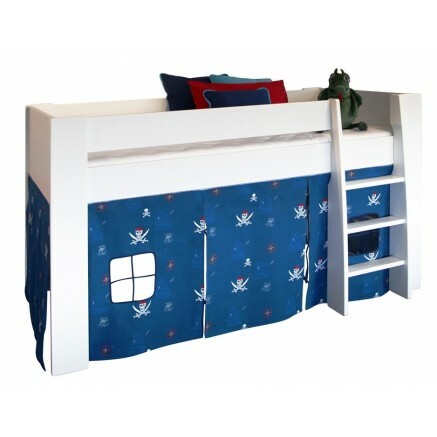 Have you ever considered a mid sleeper bed for your child? We have a mid sleeper bed for my son. We all love it - except when it comes to changing the sheets! My kids (I have three) would all LOVE to have one of these. At the moment the younger two are in bunk beds but we've been thinking about changing this soon and mid sleeper beds sound like the perfect option.